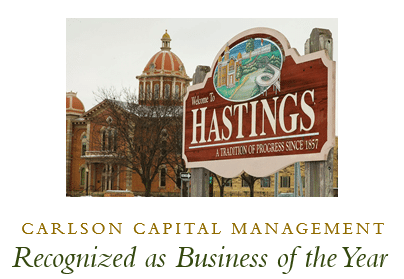 We are very happy to share that the Hastings Area Chamber of Commerce has named Carlson Capital Management as the 2015 Business of the Year. The annual award recognizes local businesses whose contributions have made the community a better place in which to live and work. CCM accepted the award at the Chamber’s annual meeting, held on Tuesday, January 26, 2016. “Hastings has been one of our firm’s home locations since we started nearly 30 years ago and we are very proud to be part of this community. Hastings Star Gazette features CCM as Chamber of Commerce Business of the Year. The Hastings (Minnesota) Area Chamber of Commerce does not have the criteria for this award publicly posted. The organization invites its members to complete a nomination form for this award on an annual basis. According to the Chamber’s Facebook page, the organization’s Executive Committee selects the winner each year. CCM did not pay a fee to the Chamber to receive this award and has paid no fees to the Chamber to promote the award. CCM did not complete an application for this award–the Hastings Area Chamber of Commerce independently honored CCM with this award. According to the organization, awardees of this recognition must be active members of the Hastings Area Chamber of Commerce.